On this reflection we analyzed the current challenges companies are facing to manage business processes. Currently people are fighting against the meaning of things. Knowledge is no longer in procedures, in flowcharts, is spread across systems, sensors and streams. Knowledge is not anymore inside of company boundaries. People interaction connected to companies are changing or are about to change as quickly systems to socialize are spreading. You cannot stop this paradigm. You can block social iteration for a while, but as new generations start working in the company you will need to adapt because these new bright lads don’t know how to work differently. There will be no regression. In part one we saw that people want information that systems cannot interpret because questions are put in natural language. In part two we discussed the paradigms of ontological management and how it can help to overcome the challenges outlined above, but it must be adaptive, dynamic, and evolve as organization domain changes. Ontologies cannot be a one time snapshot. In part three it was defined a model for process, domain and organization ontology discovery. On this last article we integrate semantics on business process management cycle. So far we focused on a framework to build ontologies for process, domain and organization and how it can support enterprise architecture. Process ontology: Identifies all the artifacts that describe a process, regardless of whether it is structured or not . It allows building clearly and unambiguously all process elements, linked with the domain ontologies that specify enterprise concepts, as well as the business rules, roles, outcomes, and all the other inter-dependencies. Domain ontology: its not a glossary of terms, is what defines the company sphere and represents what the company does. This ontology provides vocabulary of concepts and their relationships, about the activities performed and on the theories and elementary principles governing that domain. Organizational ontology: Identifies who participates in the work executed and how people are connected through the work and responsibilities assigned to them. Ontology construction and its maintenance are beyond the scope of these articles series, but these references are a good starting point , . As companies increasingly rely on information systems to run their processes it is necessary that systems provide semantic capabilities that allow them to use and apply ontologies, thus becoming intelligent. As already highlighted before, systems still do not have fully developed intelligent capabilities to interpret information. Continue to be mere repositories of information in relational databases, but do not allow people to get the data they need to work and to reason. Paradoxically, systems turn out to be a barrier to understanding the enterprise as a connected system, unable to capture the characteristics of the organization in various dimensions: processes, domain and organizational. As dominance of unstructured work increases, integration of ontological management in enterprise architecture becomes more important for knowledge management challenges. In 2009 it was already pointed out  the rise of knowledge management (although Drucker predicted by the 60’s ! ), a trend coined under the term adaptive case management. As pointed out by Deborah Miller  today with the growth of unstructured work people have to adapt to the unexpected, overcome challenges and achieve the unpredictable nature of our activities to achieve our objectives, management in this context, human judgment, external events and business rules do not determine the paths through a pre-defined (as a process flow) path. Rather, these factors determine in real time the activities that must be performed. Research: Time wasted searching for information and their intra-relationships. That is why the ontology management plays a key role allowing people obtain artifacts they need to work with, business rules, and remaining content in a facilitated manner. The Business Process Management is usually based on these simplified four stages. This model is independent of the nature of the process that is running: structured or unstructured. I still don’t believe that BPM does not apply for unstructured processes. Design phase: It defines how the process is going to be executed. In a structured process includes the process model everybody will have to follow. In an unstructured process, the process is constructed in real time, people define the set of actives and the information they need to work with. At this stage the existence of a pre-defined ontology supports the understanding of the nature of the tasks that must be performed, and the nature of the concept of each informational entity. Thus it eliminates the ambiguity of natural language usage to the detriment of the concepts that are part of the ontology that is being used (process, domain, or organizational). The process model construction supported by an ontology can later be used during automatic Web Services linkage  if the process is automated all the elements that describe the process can be constructed in a format capable of being interpreted by machines, using for example XML. 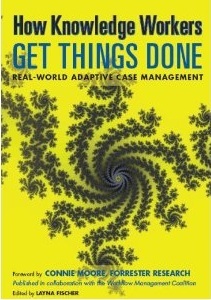 Another advantage is the possibility of reuse process models something that is a reality on adaptive case management. Implementation: SOA is here for a while but companies struggle to connect seamlessly systems. One of the biggest challenges of adaptive case management systems is how they address connection in real time with data stored somewhere. A user cannot figure it out or manage to connect to it. To make it possible endless connection capacity, it’s necessary to semantically describe all aspects of the services that are available through the interfaces. The standard WSMO  sets out how services should be described. The process of building an ontology to describe a particular context is usually time consuming. In order to facilitate the introduction of ontological concepts, especially those that are internationally accepted in a particular industry WSMO was designed to be modular to the point of importing existing ontologies. The WSML  an extension of WSMO that defines a formal language to describe ontologies, goals, Web Services, semantically and a model for managing different language variants encompassing both logic descriptions as logic programming. Process Automation: Putting the process on execution mode involves the translation of all the artifacts that defines it. If there are no process models and Web services that can be reused, they are created and stored in the shared registry, otherwise it’s made ​​the discovery and connection to the process models (or process models parts) when the process is first installed or as you are execution it in adaptive case management mode. It is not necessary to make adjustments on message communication protocols, transport, security, because these features are supported automatically. 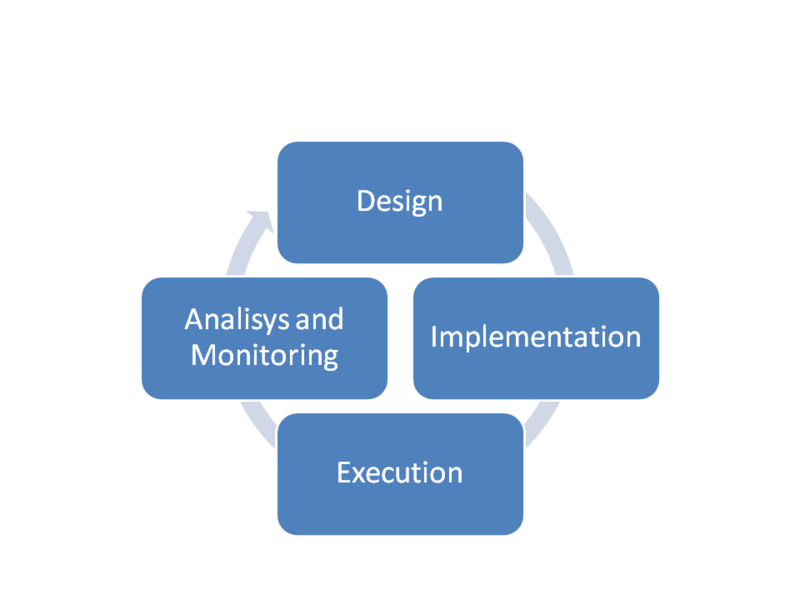 Execution: Under a semantic approach services are automatically discovered, linked to activities that invoke them in real time as opposed to a classic design highly coupled used specifically for the particular implementation of a process. Analysis and monitoring: Both the analysis and monitoring use predefined reports or dashboards, thus limited to fixed content. Semantic Business Process Management allows users to search and correlate information dynamically supported by data recording semantically annotated by a system engine put in place for execution. Despite bottlenecks identification (tasks running more than once), workload balance and KPI’s provide important information about execution and improvement opportunities, the dawn of running unstructured processes or a bend between structured and unstructured, where execution is driven by events, questions, curiosity and outcomes is particular difficult to extract information to carry on our daily activities supported by predefined control mechanisms. People cannot way anymore one week to get hands on the data or an app than needs to be developed for a special purpose. One last thought. Google Wave the trigger of this articles series is on read only mode. Is no longer supported by Google. Funny how concepts evolve. Web Service Modeling Language – J. de Bruijn, H. Lausen, R. Krummenacher, A. Polleres, L. Predoiu, M. Kifer, D. Fensel http://www.wsmo.org . This entry was posted in ACM, ASTC, BPM, Enterprise Architecture, Ontology, Semantic BPM, UMAP. Bookmark the permalink.